Each chapter begins with an introduction and ends with a summary, appendix, and a list of resources for readers who would like to explore the subjects in greater depth. The book is an ideal resource for researchers in electrical engineering and computer science and an excellent textbook for electrical engineering and computer science courses at the advanced undergraduate and graduate levels. 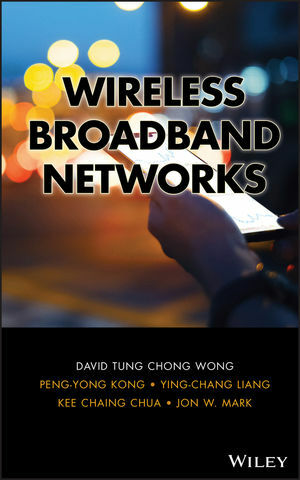 DAVID TUNG CHONG WONG, PhD, is a Research Scientist at the Institute for Infocomm Research, Singapore, and he is the Networks Editor for World Scientific's International Journal on Wireless & Optical Communications. His research interests include wireless/wireline multimedia networks. PENG-YONG KONG, PhD, is a Senior Research Fellow at the Institute for Infocomm Research and an Adjunct Assistant Professor at the National University of Singapore. YING-CHANG LIANG, PhD, is a Senior Scientist at the Institute for Infocomm Research and holds an adjunct associate professorship at Nanyang Technological University and National University of Singapore. KEE CHAING CHUA is Professor of Electrical & Computer Engineering at the National University of Singapore. He has published more than 200 journal articles or conference papers and coauthored one other book, all on wireless or optical networks. JON W. MARK, PhD, FCAE, FIEEE, PEng, is a Distinguished Professor Emeritus and Director of the Centre for Wireless Communications at the University of Waterloo, Canada. He has published more than 350 journal or conference papers, coauthored two other books, coedited one book, and published more than twenty book chapters.